I’ve had this bath bomb since it came out near christmas, but I never got round to using it untill the other day. I was a little put off by the smelll of this bath bomb, which I will come to later, and the colours aren’t all that pretty to me. But boy was I wrong to judge this bath bomb on its looks and initial smell. I’m learning more and more as I get into Lush that things end up chnaging and developing in the bath water, or in the shower, and I need to be more open to smells and things I think that I might not like. 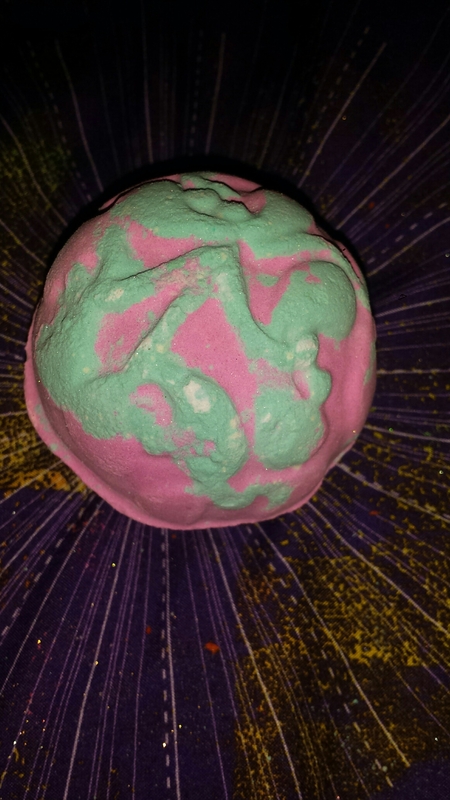 Lets start with the smell of this bath bomb, it smells very floral, like Jasmine. Which is something that I honestly don’t like. I have never liked floral smells unless its been something like lavender which is about the only floral smell I can deal with. I think this bath bomb shares its smell with the Silky Underwear range at Lush, though I could be wrong about that. 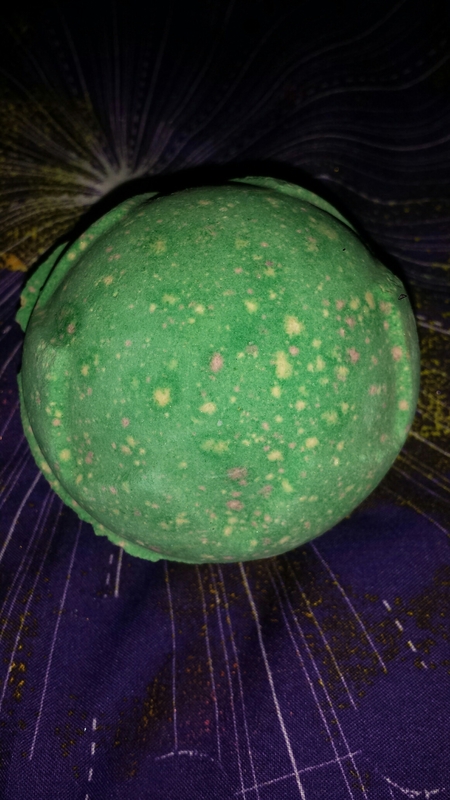 The colours of this bath bomb are light green and a pinkish colour with some white on the outside. These colours combine with the colours in the centre to create bath water which is dark purple. 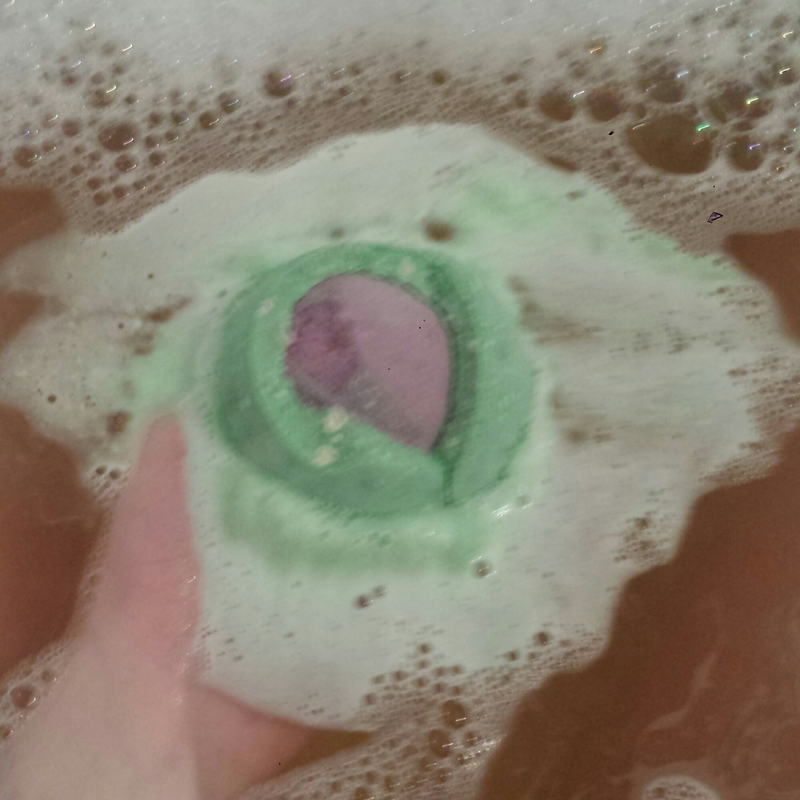 I think the centre of this bath bomb was a more dark pink to purple colour. I can’t really say much about this bath bomb other than it was released at Christmas time, it smells like Jasmine and other floral elements. The colours are wonderful, and complement each other really well, and create beautiful coloured bath water. I probably wouldn’t buy this again if it came out this year as the smell just isn’t for me, even though it does smell nice, but it took me a long time to accept the smell before I used it. I never thought I would ever get round to using my Roller bath bomb which was so very precious to me, but I did just the other night and my god it was amazing. Lets set things off with how this bath bomb looks. The top of the bomb is a melt which is purple in colour, sometimes dark purple and sometimes lighter purple it depends on which batch and how fresh the Roller is, as fresher Rollers tend to have a more vibrant colour melt. The bottom half of the bath bomb is a simple white colour, nothing fancy. The inside of the bomb is blue and pink in colour which combine to create purple. When you first put this bath bomb into the water the while bottom part starts to foam, creating a thick white foam. once you let go the top melt part of the bomb bobs under the water as it is heavy. If you let go of a Roller right it will spin in the water but I couldn’t get mine to do that which was a shame, but I will try with my other melt top bath bombs (Never Mind the Balistics and Over And Over). 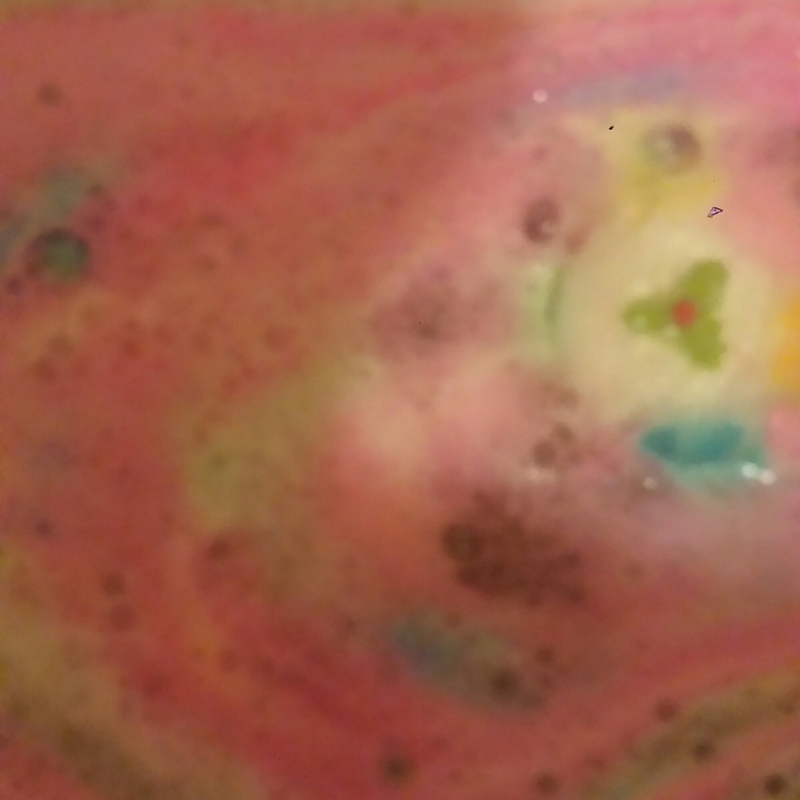 After the water gets to the inside of the bomb the pink and blue colour starts to come out into the white foam and creates swirls of colour on the surface of the water. After the bomb has completely dissolved the water is a lovely light purple colour, which is ever so slightly cloudy in colour too. The water is very soft because of the melt on top of the bath bomb which means the bath bomb makes the water very nourishing to the skin so you don’t have to use a lotion after your bath. You skin will be left with a light strawberry smell which is very soft and light. The smell also fills the bathroom and the entire top half of my house and right down to the bottom of the stairs which I found very surprising considering that the smell of Roller isn’t all that heavy. This was one of the best baths that I have had in recent days and honestly I love Roller so much, I wish I could get some more. Next time they come into stock online I’ll try and get some because honestly Roller is one of the nicest bath bombs I have ever used. This bath bomb is amazing, I don’t know how I hadn’t tried it before. I wish I had tried it sooner as this has become a favourite of mine, I love the smell of LoM and I hope to try all the things scented like LoM. And like a lot of other lushies I’m on the look out for a LoM liquid perfume. Anyway this bath bomb is super foamy when you first put it into the water, which creates a sort of light green foam. 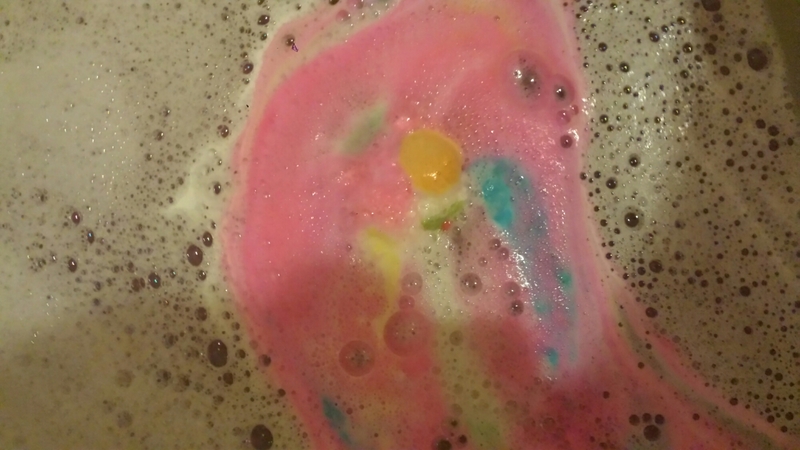 Then as the layers of this bath bomb fizz away in the water, the popping candy inside starts to crack and you feel like you’re sitting in a very autumnal bath. Then the centre red colour comes out, with mine I found it started to come out of a small hole in the side of the bomb, and it looks like blood coming out. The red and green combine to create a sort of deep wine red colour. For the final water. 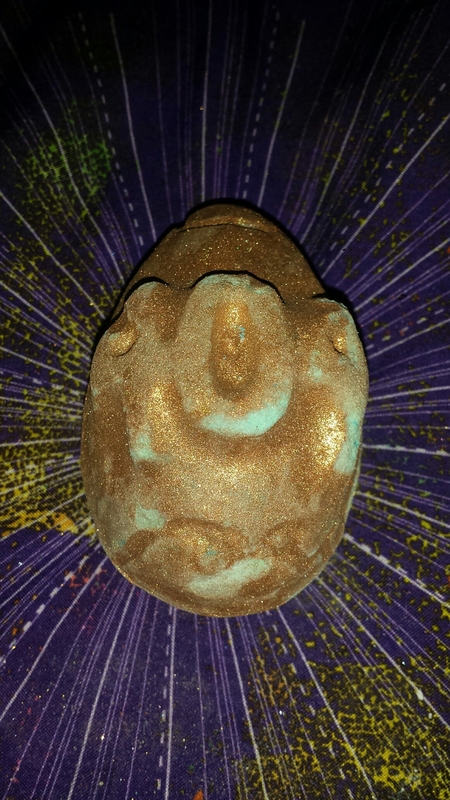 I don’t know of there is any lustre in this bath bomb, though I used it with Sparkly Pumpkin which has so much lustre I wouldn’t be able to tell if there were any lustre in this bomb. Everything about this bath bomb is beautiful. The smell, the colours, the popping candy. This is a very autumnal bath bomb, honestly perfect for the colder months, as I think the smell is very warming. I got this from the Lush Kitchen a while back, bought mainly because of the name. Top Drunk sort of intreagued me. I used some of it in the shower but I found that I couldn’t get it to work as it was supposed too. So I gave up and used the last chunk of it in the bath. And oh boy am I glad I did just that. It didn’t colour the water as such just sort of made it a murky colour which was okay as I don’t mind if a bomb makes colour or not. I used this in the summer when it was really hot the oils in this Emotibomb made my skin feel instantly cooled and refreshed when I got into the water. I’m glad I ended up using this in the bath as it worked so much better I was able to smell the bomb more clearly though not for long as the smell didn’t seem to linger. It didn’t last on my skin either which was a shame. I combined this with Freeze shower gel which was also from the kitchen and honestly it was so cool thing and soothing to my hot skin that I would do it a thousand times over. I used this bath bomb last night and I have to say I was slightly (more than slightly really) disappointed with it. I’d never seen or used an Error 404 before they were released last year near Christmas. So I decided to buy 2 anyway without even thinking about it with the rest of my Christmas order of that year. And when they came I fell in love with them, so I stored them away carefully in a bag like all of my other bath bombs and popped it into the box which is where my bombs and bubble bars were stored at the time. So I get out this bath bomb from the drawer, where they are now stored, and found that one of them is a little soft, so I picked that one out to use up first thinking the other one was fine. So I take it into the bathroom and run my bath ready to use my first ever Error 404 bath bomb. Let’s get onto the good things before I tell you all about the negative, shall we? Error 404 smells like vanilla and coffee to me which is a nice smell, I would love a perfume or something similar which smelled like this, or any other items that smell the same. I definitely picked up on a coffee vibe from it. I think the smell would have been lovely on the skin, though I did find that once in the bathroom the smell had sort of gone, but that could have been because I kept it for a while. Error 404 features a 404 embossed on the front and on the back is a sort of circuit board type design. The outside of this bomb is covered in bronze coloured lustre. Which gets on everything. And inside there is blue lustre and more bronze lustre. The inside of this bath bomb is green and blue and leaves you with beautifully coloured green/blue water, which makes you feel like a mermaid in the bath. 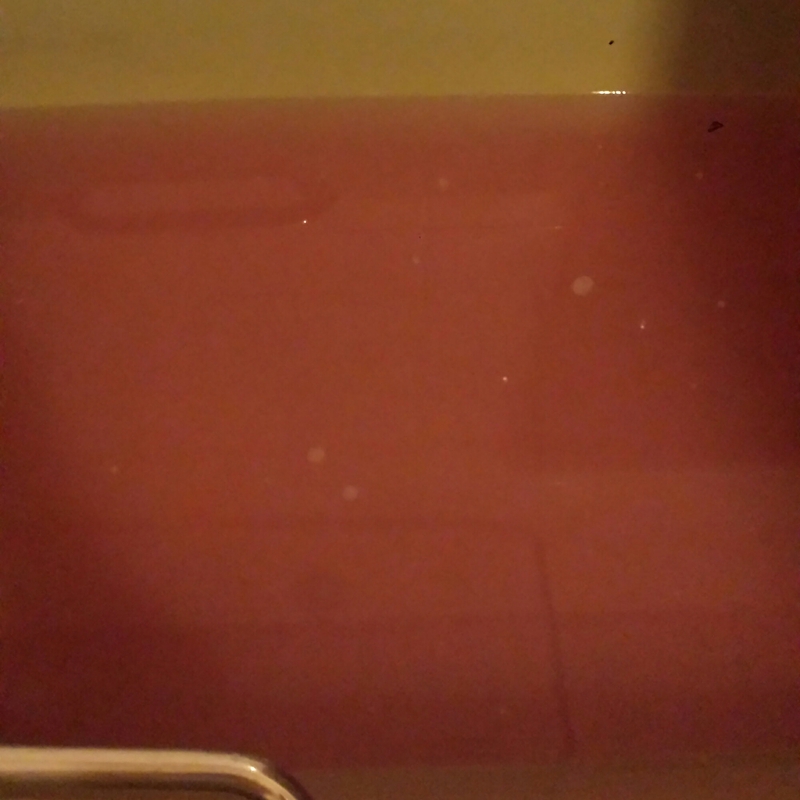 The water is an amazing colour once the bath bomb has dissolved. Now I can’t tell you how long this bath bomb would take to fizz away as mine was a complete dud. As soon as it touched the water it just fell apart completely. 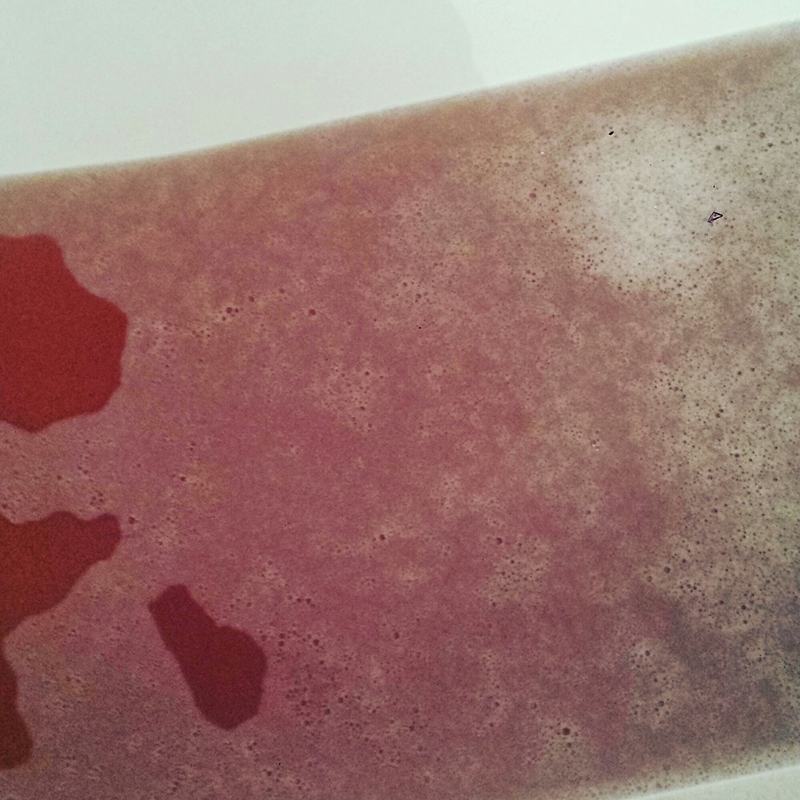 The whole bath bomb just collapsed into the water, none of it even fizzed at all which I was very disappointed by. Since it had been stored correctly for the entire time that I’d had it. My second one has been put into my dust jar as I wouldn’t be able to use it in the bath like normal, so now my dust jar is full and ready to be used in the bath one time. I have no idea what is in my dust jar other than this Error 404. I used this before I came back to uni as I know they don’t keep well and it wouldn’t have lasted until I came home for easter. This bath bomb smells like lavender, a nice smell which I do like. 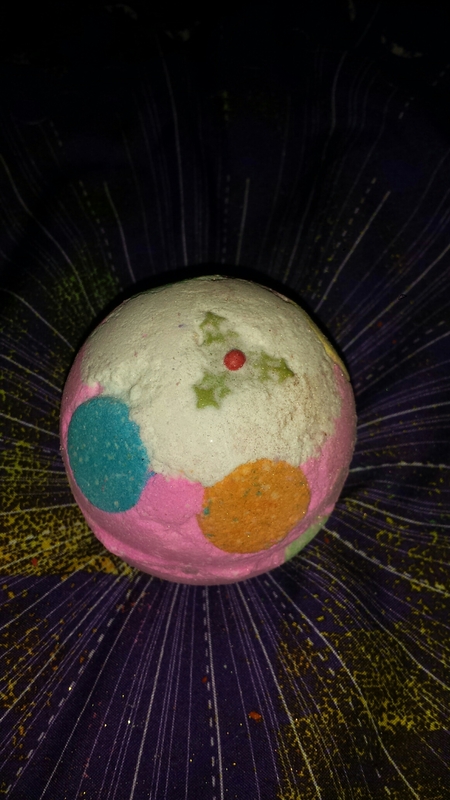 I love the Twilight bath bomb, A French Kiss Bubble Bar and all that. The colours of this are really pretty lots of pink, with disks of blue, yellow, green, purple and so on. Which puts on a lovely show in the bath. 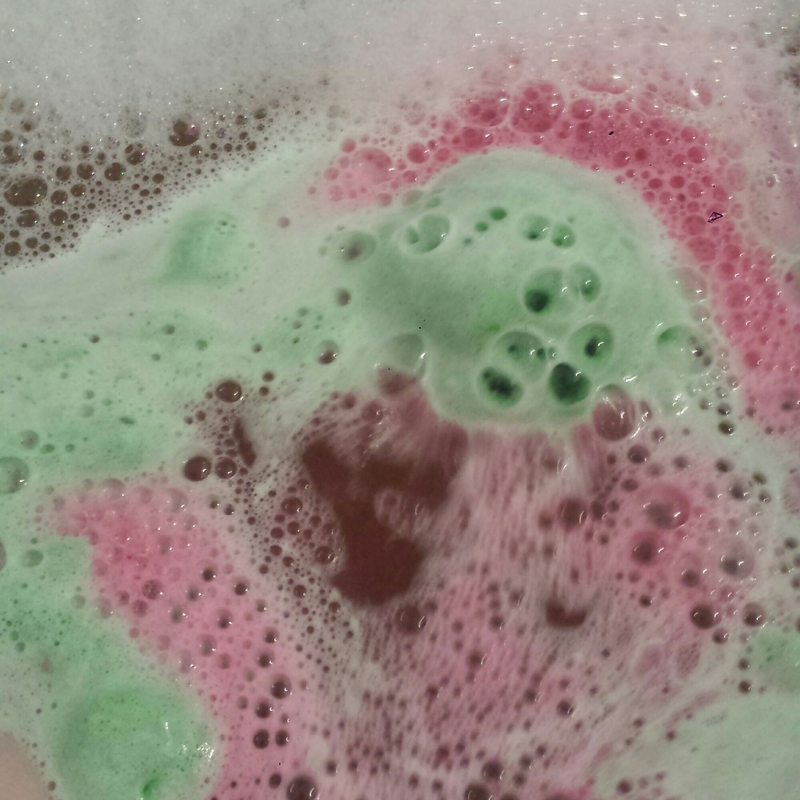 I was really underwelmed with this bath bomb because once it was in the water it didn’t smell very much at all. When when I lifted it out of the water to smell it again it just smelled like bicarb with a hint of lavender. I wished it had smelled as good in the water as it did out of the water.